The Montgomery County, Tennessee bill of sale may be used as a receipt for a transfer of a vehicle or boat from one party to another. The form should be completed online by filling-in the highlighted fields or handwritten after printing. After the details have been entered the bill of sale is required to be signed in the presence of a notary public. Odometer Disclosure Statement – Only to be used if the vehicle being sold is under 10 years and below 16,000 pounds. Clarksville Drivers Services Center – Go to register the vehicle. 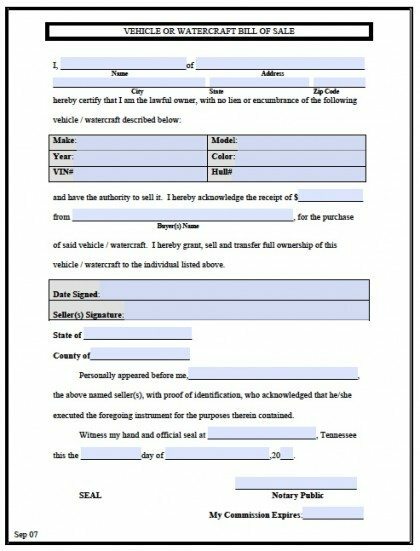 Notary Acknowledgment – This form is required to be signed by a notary public.